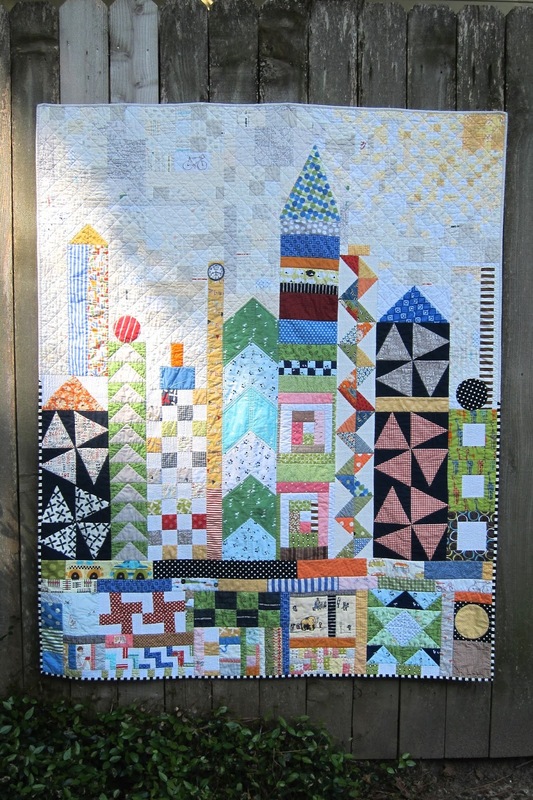 My small world is quilted, bound and shipped to it's new home. GIVE AWAY . . . CLOSED - Congratulations Bev M. I've sent you an email. I have a lovely stack here of Sphere by Zen Chic to give away. If you'd like it, leave me a nice note. 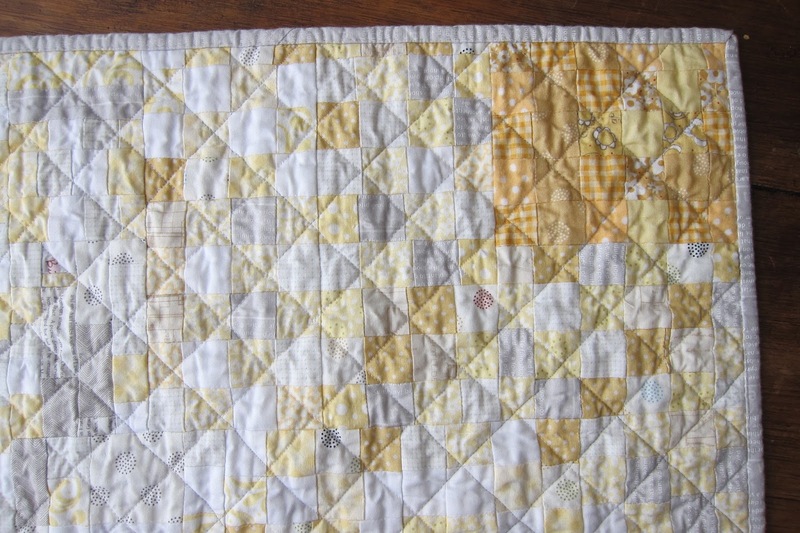 I love using Aurifil thread, but am worried that with wear and tear on a quilt, that the threads will break in time compared to other threads. The strands seem so thin. What do you think? Every time I see a version of this quilt, I love it more and more. Very fun! Great finish. It looks lovely with the sunshine coming across your picture. Such a pretty quilt. Some of that piecing looks tiny and very difficult. I haven't used aurifil but I have the same worry over cotten thread. Will it rot over time? I guess I'd still rather a quilt fell apart through use, love and washing rather than being hidden away. Wonderful quilt. I like the little clock on it too. I've thought the same thing about Aurifil and have wondered if it will hold up. I love how it sews through my machine tho. Thx for the chance to win Sphere...so pretty. 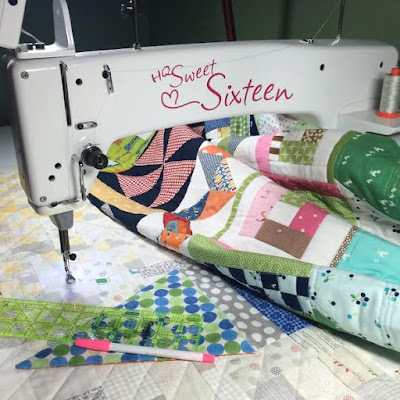 Your Small World quilt is amazing! I wish I had caught on soon enough to get the pattern from te magazine! It looks like there are so many things you can do to personalize the quilt! Thanks for the chance to win such pretty fabric! Love your personal take on the my small world quilt. I've been using Aurifil for a while now and so far see no degradation of the thread. Thanks for the chance to win some of that very happy fabric. I love your quilt. So unique. I'd love to add to my Zen Chic Sphere stash. Thanks for the giveaway. I love your Small World! I love the back as well! Great job! That is such an adorable quilt! Your quilt is wonderful. So colorful! 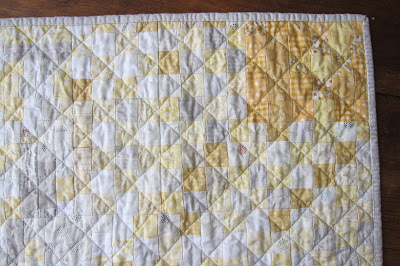 I love Aurifil thread and use it for everything but haven't actually washed any of the quilts very often. It's cotton and strong even though thin, and I would think it would be fine. I'd love to live in your small world..it looks like a very happy place! I've never used Aurifil thread, so I am not able to help you with your question. I just use whatever I have in my thread stash, including thread that is probably 30 ad 40 years old. If it does not break while sewing, I have no fear that it will hold up in the long run. Oh I would love this fabric! Pick Me. Pick me. I love your quilt it is sooo cute! Thanks for sharing this. I linked at Crazy Moms too I'm #100! Have a good weekend. I like the quilt but have not used the thread. Ma y websites are recommending it. The small world quilt looks like a fun pattern. Beautifully done. Your quilt is darling! I'm a fan of scrappiness & this is a delightful one! What a lovely quilt. It must have been fun working on it. Sorry, I can't comment on your thread situation. I am a hand quilter and like using Coats and Clark threads. I would love this stack. i think i could make it boy and that is what i really need right now. I would love to try this thread, i think it was recommended to me yesterday at a quilt shop. it is thinner and long-armers like it because it extends the bobbin thread sewing time between reloads. This stack wouldo fill a void in my stash ! Such petty colours in your give-away bundle - I don't have many yellows at all! Love your Small World quilt too. oooh, I love those fabrics! and the quilt is gorgeous! you sold that? my my, I'd have a hard time parting with it. What a whimsical quilt! Love it! Thanks for the giveaway. Your quilts are always so beautiful! I think I've mentioned this already, but I LOVE your little sun in the corner!